The huge living area boasts two sofas, a separate comfortable seating area, a 50" flat screen TV, DVD player and access out to the large balcony that has a comfortable sofa set. Entertaining and cooking is a pleasure in the fully-equipped modern kitchen with stainless steel appliances, granite counter tops and a breakfast bar with stools. 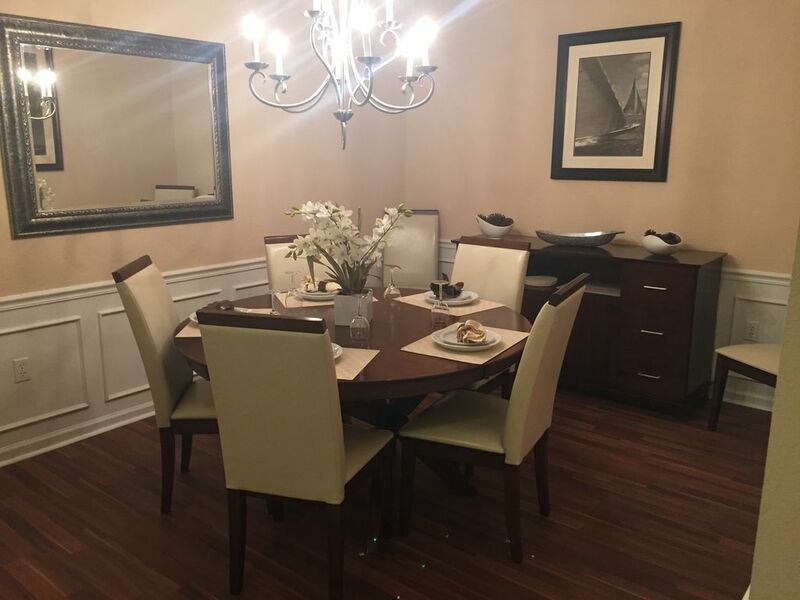 There is a beautiful formal dining room with table and chairs to seat 6. The master bedroom has a king-sized four-poster bed, a flat screen TV and a huge en suite bathroom with separate shower and tub. The second bedroom also has a king-sized four-poster bed and a flat screen TV. The third bedroom is a twin room with flat screen TV. There is also an extra hideaway bed available so this impressive condo can sleep a total of 7 guests. The laundry room has a washer, dryer and ironing facilities. Linen and towels are included. For families with babies, there is a high chair and a fold-out crib for complimentary use. This property has air conditioning throughout and has free Wifi. The building also has an elevator and free parking is available right outside the building. Vista Cay at Harbor Square offers all the amenities you need to make you feel right at home. The community has a walking trail around Lake Cay, a large community pool with enormous multi-level decks and cabanas, heated spa, a separate gated children’s pool, picnic area and basketball court. The clubhouse has a fitness center, movie theatre, arcade/games room and a concierge desk. Perfect location to get to all the theme parks in a few minutes. This was a great rental property at a great price. Convenient to convention center and with 10 miles of Disney Parks. The condo is spacious nd the amenities, including the pool and hated entrance are very nice. Within 10 miles of any of the Disney attractions and right next door to the OCCC. Loved our stay! Very nice unit, spacious and beautiful. Would definitely stay again in this unit! Loved our stay! Convenient to the convention center for our business trip. Clean and spacious! Had an event at the convention center. We then spent time at some of the attractions in Orlando. Great location for all. Nice balcony to sit out and review the days events. Kids enjoyed the arcade. Parking convenient. Beautiful condo. Would love to go back. We are very happy with our Home Away experience. Condo was beautiful and comfortable. Very conveniently located near Disney and Universal. Accidental Damage Waiver We understand that accidents like spills and stains happen. For a flat, mandatory, non-refundable $50.00 fee, minor accidental damage up to $500.00 will be waived. If damage exceeds $500 or is deemed intentional, or the result of gross negligence or willful misconduct, this Waiver DOES NOT apply. The waiver covers ACCIDENTAL DAMAGE ONLY Adhere to rules outlined in booking confirmation pack.